The moment Paul Trott let his two dogs out in the backyard he could see a problem. Someone had broken the gate at the rear of the yard, and the dogs made a dash for the opening and into the alley beyond. As his partner Josh Lyczkowski ran out the door to collect the dogs, they heard someone in the alley shout “No! Don’t! Stop!,” according to Lyczkowski. Then they heard a gunshot. Their largest dog, Tito, a Cane Corso that weighed about 120 pounds, had been fatally shot in the head. Lyczkowski arrived so soon after the shooting that the police officer who shot the dog still had his gun drawn. Tito, who was nearly two years old, was killed two garages down the alley from Lyczkowski’s property. Soon after the shooting, Lyczkowski and Trott learned that a man suspected of stealing a car had broken their rear gate while fleeing from police officers. The officers were in the neighborhood because they had been searching for him. Lyczkowski said after the shooting the officers asked him if he wanted to hear an apology from the suspected car thief, who had been captured. Lyczkowski said yes, and the police brought the man to Lyczkowski, who vented his frustrations about his dog’s death. The police blamed the shooting on the car thief and the broken gate, Lyczkowski said, but he was left fuming. “They should be trained not to murder housepets,” he said. 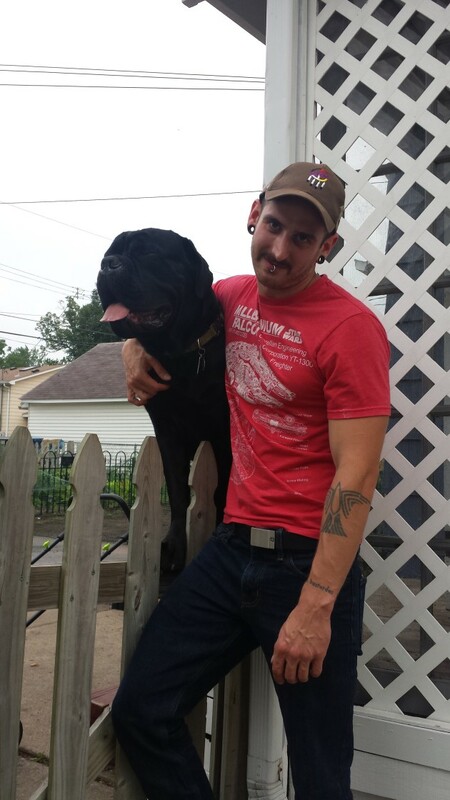 Lyczkowski said his other dog, a Cane Corso named Vita, ran back into the house after Tito was shot. The scene was taped off and Tito’s body was eventually taken away by city animal control officials. Photo: Josh Lyczkowski and his dog Tito. Courtesy of Josh Lyczkowski.